Where you start plays a major part in where you will end up. If you start with a perspective that the Bible is wrong, you are not likely to draw the conclusion that Jesus is the Savior of mankind. In this way, our cognitive biases shelter us from accepting certain variables and contradictions to the beliefs that we hold. Most people are unlikely to challenge their preconceptions when confronted with definitive truth. As a culture, we are bent toward our own presuppositions and we develop filters to rid our perception of any opposition. As a result, we do not read widely, we don’t offer any credibility to anyone outside of our camp, and we reject any notions that do not fit inside our nicely formed structures of thought. As a Christian, I feel that it is critically important that we search for clarity and refinement of ideas. We live in an age where studying is a taboo and the media is the primarily trusted source. Christians and non-Christians by-in-large do not have a clue how much they are being mislead and deceived by those they trust. Michael Shermer’s book, “The Believing Brain,” is geared to point out how our mind is wired to perceive truth where we want to see it. Michael Shermer is the president and founder of the Skeptic Society and the chief editor of Skeptic Magazine. He has written several different books on the subject of Science and it’s history. A self proclaimed atheist, Shermer was once a proclaiming Christian. He did not have a stable foundation for Christian faith in the home, but professed to be born again when he was a senior in high school. Doubts started to form in Shermer’s mind after debating with intellectuals in graduate school. In the book, Shermer shares a personal experience from when his college girlfriend was in a car accident and paralyzed for life. In a moment of fear, Shermer prayed that God would heal the girl. When his prayer went unanswered, Shermer turned his back on Christian belief. 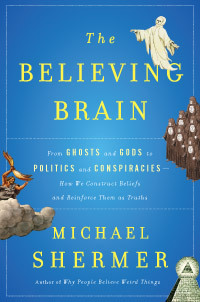 “The Believing Brain – From Ghosts and Gods to Politics and Conspiracies, How We Construct Beliefs and Reinforce Them as Truths” is a skeptics approach to how we come to certain beliefs. Intertwining scientific data about our brains, Shermer explains how we are lead to draw conclusions and how we become so adamant about what we believe. The book, as a whole, is an interesting study that points out the trappings of every belief system; whether it is faith, science, politics, or paranoia. Though Shermer is attempting to be balanced in his examination of all walks of life, he does overlook many of his own trappings, while admitting others. Shermer spends a great deal of time attacking the fundamentals of Christian belief, but he does offer many of the same attacks on scientific limitations as well. However, his conclusion is that, while science is limited, it is the ‘best’ source for coming to definitive truth. He makes an interesting statement in the book that no one can truly be an atheist because no one can prove that God does not exist, but on the other hand, no one can function as an agnostic because we either live as though God is real, theism, or we live as though He is not, atheism. The book is broken down into four sections: The Journey of Belief, The Biology of Belief, Belief in Things Unseen, and Belief in Things Seen. In the first section, Shermer catalogs three different stories of people who’s beliefs have shifted by different means. First he tells the story of a brick layer with a supposed alien encounter who quits his job and devotes his whole life to the pursuit of the extraterrestrials. Then he tells the story of an atheistic scientist who became a devoted Christian through an intellectual argument from reading C.S. Lewis’s “Mere Christianity.” Shermer concludes the first section by telling his own story of how he moved from being a professing Christian to an atheist as a result of the doubts he was facing and the emotional disappointment of his girlfriend being paralyzed. In writing three different scenarios, Shermer is attempting to point out the many different variables in which we are lead to form our individual beliefs. The second section deals with how the brain works and stresses how scientist can explain many anomalies which had previously been associate with miracles and visions. While it is an interesting study, this section was the least engaging. In section three he makes a case for the burden of proof. That which is unseen and cannot be tested cannot hold the same level of weight as that which can be examined and proven. He takes two chapters to attack the existence of God and a belief in the afterlife. Unfortunately, his conclusions are very broad and he associates the same illogical approaches for everyone who would draw these conclusions without considering the Bible as a source for authority. He also points out the foolishness with conspiracy theories and alien encounters making the point that our brains can be lead to see evidences which are not actually there. His argument against 9/11 conspiracy theorist is particularly well argued and I would even say the best source for addressing these arguments. In the final section, Shermer discusses how we come to certain conclusions based on sciences. Here is where Shermer is fair in the sense that he points out the failings of many scientific discoverers and explains the cognitive biases which lead to their erroneous conclusions. Though, he seems to hold Darwin in high regard without offering any critique for the founder of evolutionary theory, he does make a fair argument that it is impossible to explain how life began. It can be easy to disregard Shermer’s work as an attack on Christianity, but I think the arguments in this book make for an important study in how we are lead to draw conclusions that are not necessarily true. The Church today is filled with logical fallacies and questionable practices. As a whole, Christians are not concerned with accuracy as much as they are concerned with the pursuit of happiness. This is a slippery slope which has lead to a multitude of failures for Christian involvement in politics, social justice, and missiology. As followers of Christ, our belief is not based on the abstract ideas, but the Word of God. The cognitive mistakes that Shermer is pointing out are not exclusive to wackos and conspiracy theorists. They affect Christians as well, and we ought to be aware of our own tendencies to be lead away by our own imaginations. While “The Believing Brain” is a scholarly pursuit to offer a comprehensive study on the brain and how our minds tend to play tricks on us, Shermer is not exempt from his own paradigm. While he attempts to be honest, he falls short in exposing his full limitations. While it is an excellent resource for a strong believer, I would not recommend this book without warning. The author has some obvious cognitive biases which prevent him from fully expounding on the subject, as we all do. Gallery | This entry was posted in Worldview and tagged Belief, book review, Christianity, cognitive biases, Logical Fallacies, The Believing Brain. Bookmark the permalink. Pingback: Atheism’s Universe and a Little Indian Parable. | James Bishop's Theology & Apologetics.